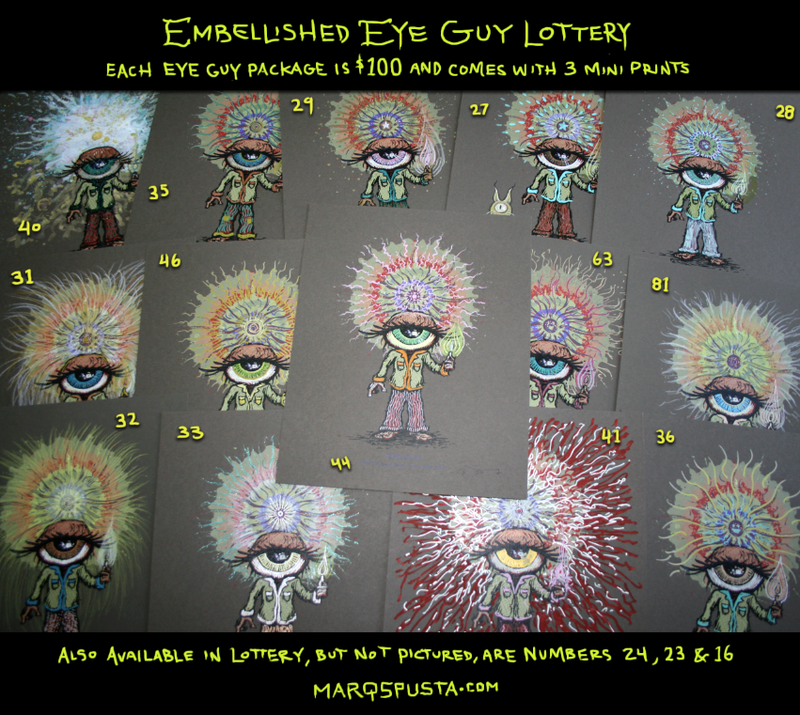 The Embellished Eye Guy Print Pack Purchasing Lottery. These Eye Guys are 8″ x 10″ screen prints in a signed and numbered edition of 100. Marq and sometimes other Spusta Gnomes have drawn on them with pens, pencils and paints. We have a stack of 17 prints (14 pictured) that will be made available in this purchasing lottery. Be sure to use a valid Paypal account email address when commenting, selected customers will be invoiced directly through Paypal in the following days. 24. just like the day of my birth, sorry Marq used the wrong email address. 40 please and thank you. And I’d buy a Flutter Friend too! #36 I love the little happy face. Thanks! Eye see 41 taken above so, 31 for me. 31 please and thank you! Gotta go with 41! Thanks! #41 Please, good luck everyone! #40 please, thanks for the chance!! Hey, you , get off of my cloud! I picked #40 above. Do you like another? I’d take my chances on #16, please and thank you! #63 and a big thank you! 46. Thanks for the chance. #27 is the coolest! Please, please, and please! since no one has chosen #81 yet that will be my pick please. thank you! I like #35! His clothes are pretty cool 😉 and thank you for the chance! 40 please and thank you! #40 please, thank you very much! I’ll take a chance with #23! Thanks marq these are all awesome! “24” My hockey and football No. Also the birth of my twins, would you have two by chance?…Love a mystery print…Thank ya kindly for your time! #31 please. Another great and unusual concept! Thanks Marq. #27 is beautiful! I would love to have it! # 46. Thanks for the opportunity Marq! Eye don’t See it happening! time to go see the eye doc, no 22 in my picture brother! #24 please, thanks Marq. Best of luck to all of you Spusta addicts. I would love #40, another sick piece by marq. Thanks for the oppurtunity. 27, my birthdate & lucky number! Please allow me to be the one for 44 ! I love #27 almost looks like he has a pet Totoro. 16 please and thank you!!!! My number disappeared like magic….so here I go again! I would die for 27… 😉 sneaky eye guy stole my number! Thanks so much Marq ! #40 please, really great idea. Good luck everybody! 27 looks pretty good to me! #40 for me – Thanks and good luck all. #63 is looking quite dapper! 81, then 27, then 63….. Or anyone really!!! I LOVE YOUR WORK MARQ!!!!! Invoices for all 17 have been sent. Thanks for all the Eye Guy interest. #40 please, if I’m not too late! 32. Love the colors! Thanks!